As we enjoy the long, hot summer days here in Texas, it can be easy to forget that the new school year is right around the corner. You’ll be putting your kids on the school bus and shuttling them between practice and other school events before you know it. The hustle and bustle of the new academic year can leave you wondering whether you are coming or going, but it is important not to lose focus on your child’s dental care routine. In today’s post, we will review four tips to help ensure your child has a bright, healthy smile from the first day of school to the last. Are you looking for a children’s dental office in Seguin? At Alligator Dental, we make going to the dentist fun! Our fun, kid-friendly office includes video games and televisions, and your child will love finding their picture on our massive wall of smiles. Contact us today to learn more about our Seguin dentists, or schedule your child’s appointment online now! Immunizations and booster shots have always been a part of back-to-school routines, and the American Dental Association (ADA) suggests making a dental checkup part of that routine as well. This is because tooth decay is so common in young children. In fact, according to statistics released by the Centers for Disease Control (CDC), cavities are the most common chronic disease for children between ages six and 19. Tooth decay is even four times more common than asthma in 14- to 17-year-olds — yikes! It is no wonder that kids can wind up missing several days of school due to oral health issues. During your child’s back-to-school checkup, our dentist will perform a thorough exam and cleaning. X-rays may also be performed, if your child is due for them, so that our team can review the diagnostic images to rule out possible cavities and other concerns that we can’t see with the naked eye. We may also speak to you about fluoride treatments and dental sealants to help prevent tooth decay from setting up shop in your child’s mouth. These efforts not only provide your child with necessary dental care, they can also prevent missed school days for your kiddo in the new year. Is your child flossing between their teeth once a day? Are they brushing their teeth two times a day for two minutes at a time? These are the recommended flossing and brushing recommendations set by the ADA, and they are important elements of proper oral hygiene for kids. Before the school year begins, talk with your child about the importance of these tasks, and model them if necessary. As you are out and about shopping for school supplies, stock up on extra toothbrushes and tubes of ADA-approved toothpaste so you have extras on hand at home. Remember to change your child’s toothbrush every three to four months. This may need to be done sooner if the bristles begin to lose their shape and integrity. If you have a hard time remembering when to change out your kiddo’s toothbrush, plan to do it each time report cards come out. Regular visits to your local dental office and proper flossing and brushing go are critical to your child’s dental health. Healthy snacks and lunches are equally beneficial, as they can provide your child with the vitamins and nutrients they need to develop healthy, cavity-resilient teeth. It can be more difficult to monitor your child’s eating habits when they are not at home during the day, so it is important to be proactive and strategic about what is available to them for meals and snacks. Many schools plan out their cafeteria lunch menus about a month in advance. If your child eats lunch in the school cafeteria most days, check out the menu ahead of time so you know what options your child will have. Talk with your child about choosing healthy options, such as whole grains, raw veggies, milk, cheese, yogurt, and fruit. 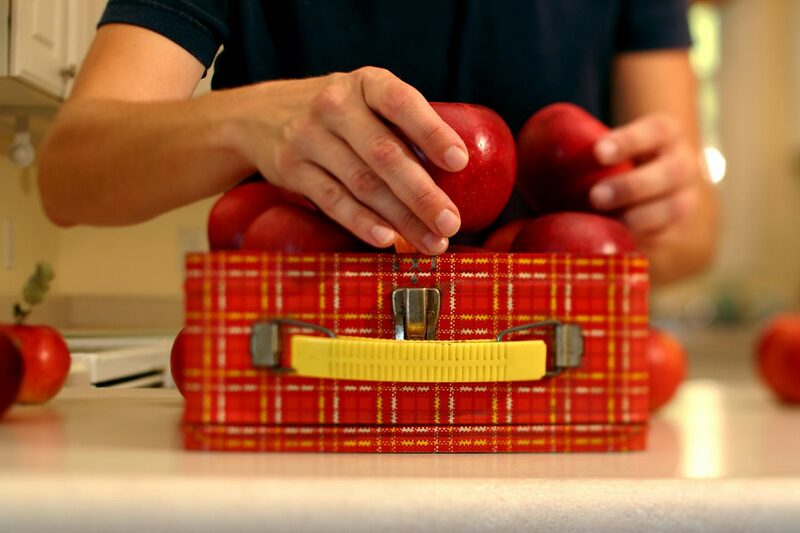 If tooth-healthy options are not offered, it is worth spending an extra five or 10 minutes packing a lunch for your child to take to school with them. After-school snacks should also be healthy, so be sure to have plenty of healthy options stocked in the kitchen ahead of time. If your child is enrolled in organized sports or physical education classes, or if they have a tendency to play rough out on the playground, then you should take steps to ensure their teeth are protected during these times. A properly fitted mouthguard can help protect your child’s mouth from injury if they are tackled, elbowed, or if they fall. Make sure that you are prepared for potential dental emergencies while your child is in school. In the event that your child does suffer some type of dental emergency, like a broken or a knocked-out tooth, call our Seguin dental office right away. 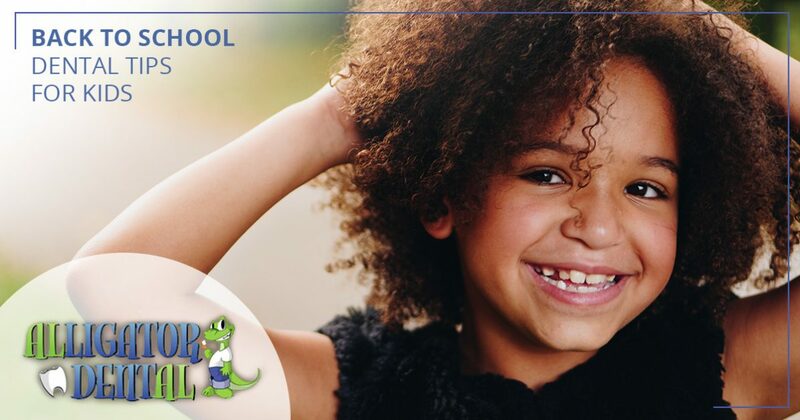 When you trust your child’s smile to the team at Alligator Dental, you’re giving your child the tools they need to build a solid foundation for a lifetime of healthy smiles. We are your Top Rated Local® dentist in Seguin, and we gladly offer a wide variety of children’s dental care, from first exams and cleanings to emergency care. We also offer back-to-school checkups that will enable your child to start the school year off right. Download your new patient forms and then call us today at 830-372-3725 to schedule your child’s appointment with our Seguin dentists!